She Is Dallas Info: Parr Park is located at 3100 Parr Lane, Grapevine, Texas. It is a free public park open to everyone. Rating: 5 stars! With the weather cooling off, we are finally starting to venture outdoors again and we’re looking for new places to play! 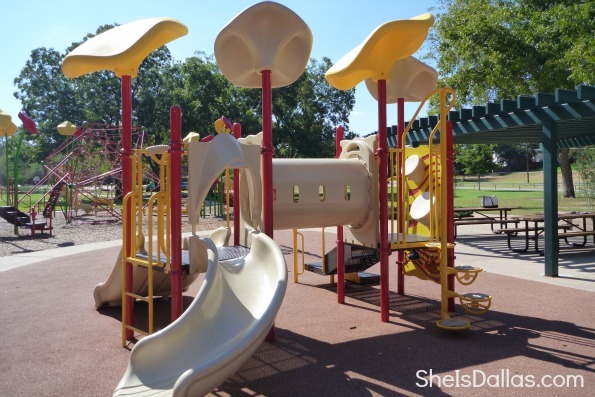 Our latest playground discovery is Parr Park in Grapevine. This park is a little over 31 acres. It is big but well maintained and quite a popular attraction in the area. The highlight of the park is the beautiful playground. We spent HOURS there! There are two sets of swings – one for big kids and one for the little guys. Both of my kids loved the giant fire truck! How cute is this? There are play structures just for the little kids. But unlike a lot of playgrounds, this one has some really cool structures for big kids to explore. In fact, the big kid area has play structures oriented in such a way that you can climb from one structure to another all the way around. It’s like a little obstacle course! 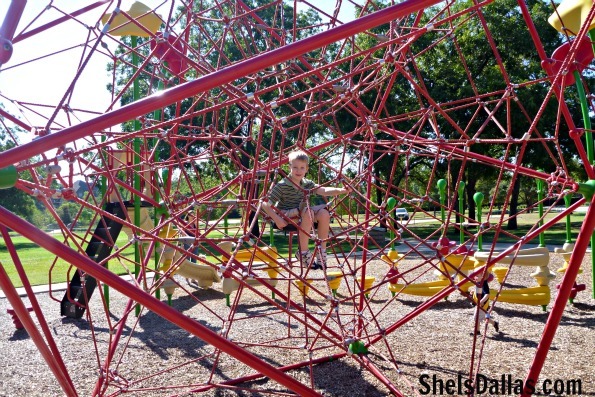 And they have one of those giant spider web climbing structures that my son loves so much! There are water fountains and clean restrooms right next to the playground. Since we last visited the park, I’ve heard that the have installed a splash pad for wet and wild fun. We need to make another visit soon so we can try it out! We gave it 5 stars! 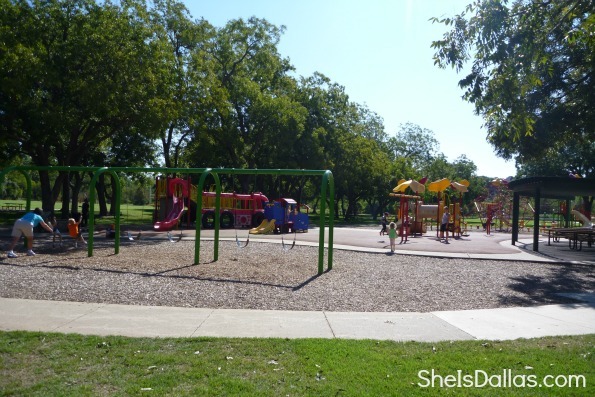 It’s one of our favorite playgrounds in DFW. 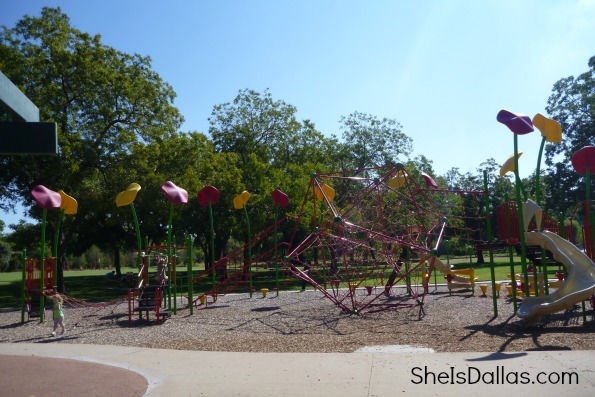 We love to explore the wonderful playgrounds in DFW. 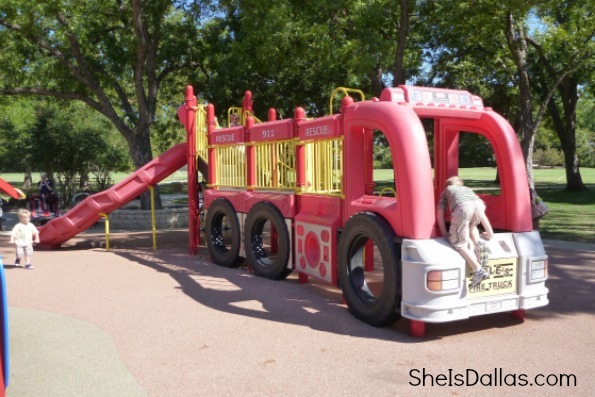 What is your child’s favorite playground? Please let us know in the comments. We’d love to check it out for ourselves and share the fun with our readers!